Perfect for Saint Patricks Day or a delicious, healthy weeknight dinner – this Easy Sheet Pan Oven Roasted Chicken and Leeks Recipe is simple, delicious, and a huge hit for the whole family! Almost no cleanup and tons of flavor on just one sheet pan! 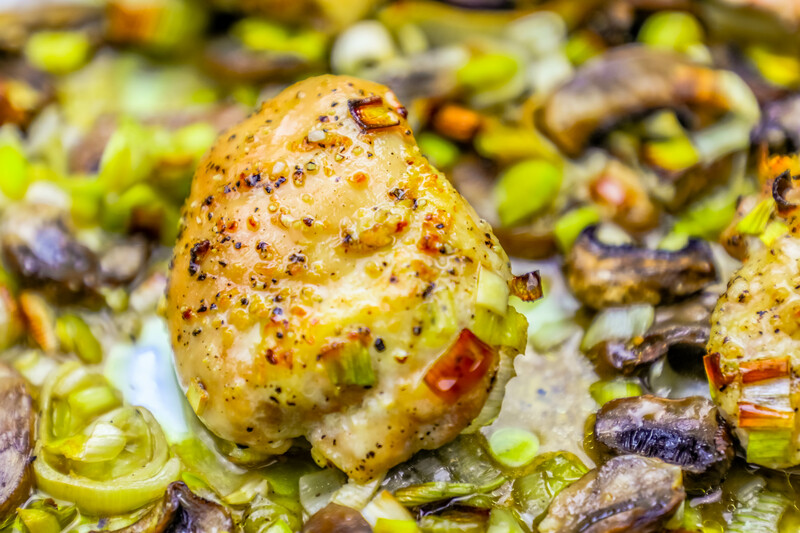 Chicken, leeks, and mushrooms are a couple of my favorite ingredients to cook with – especially as the calendar turns closer to spring, and everyone starts thinking about our favorite recipes to celebrate the Green, White, and Orange – and all things Irish! This dinner is inspired by meals I’ve had while traveling across Ireland and the simple, delicious farm-fresh flavors I love finding across the Emerald Isle. 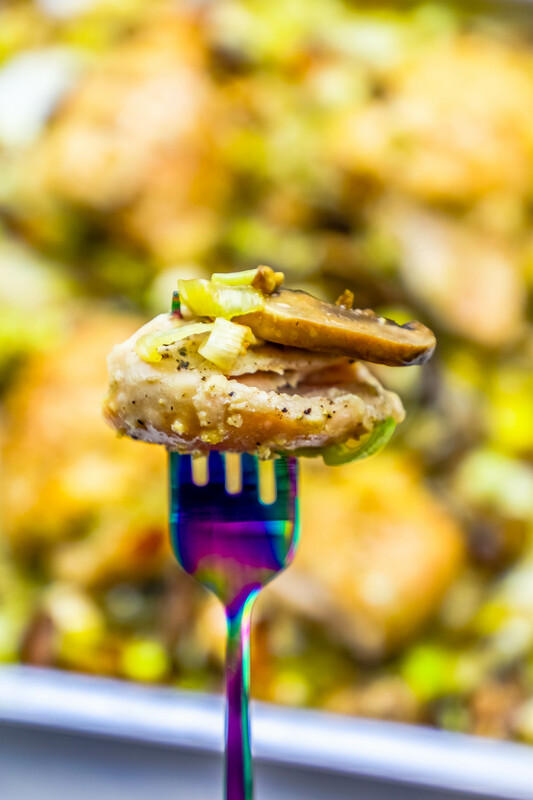 This easy chicken and leek dinner is the best way to celebrate Irish food if you’re on a low carb or keto diet – since we’re not adding carbs from potatoes or wheat – though this recipe IS amazing with some potatoes tossed in, too. This super-easy sheet pan dinner is absolutely bursting with flavor – even though all you have to do to prepare it is dump the ingredients on a sheet pan and toss it in the oven! 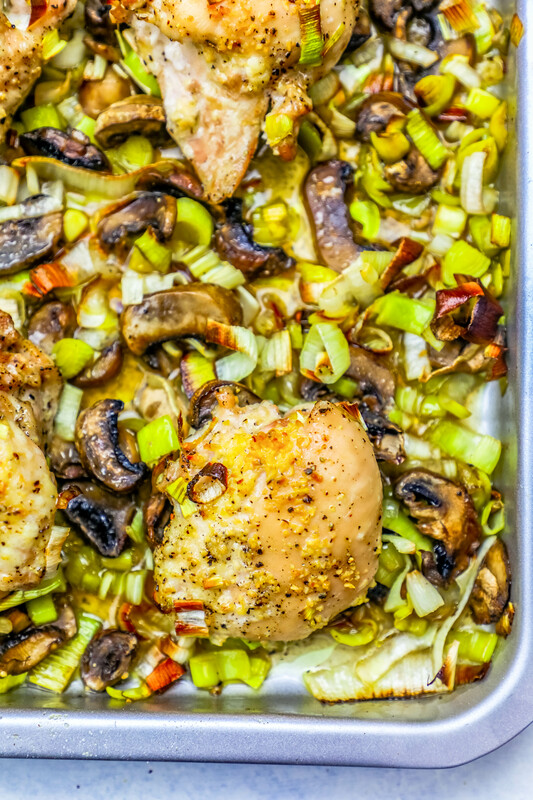 This easy chicken leek and mushroom dinner is a complete meal on just one pan – with almost no work. You can even dice up some potatoes to bake with the chicken and leeks for a crowd pleasing Irish feast everyone will love. Simply add 1-2 potatoes, rinsed, scrubbed, and cut into small 1-2″ bits to be sure they cook with the chicken. 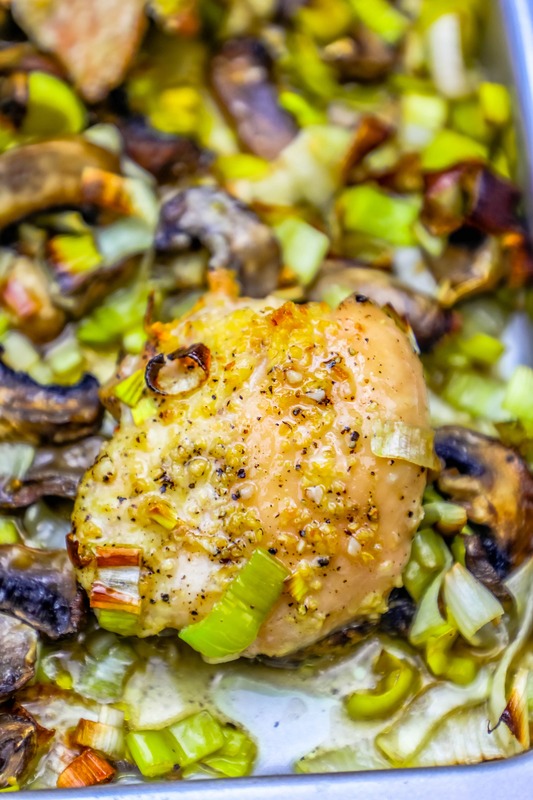 This easy oven roasted chicken and leek dinner with mushrooms is a delicious dinner the whole family loves – and is perfect to celebrate Saint Patricks day with some deliciously fresh Irish Chicken dinner flavors! One of my favorite parts of visiting Ireland (Ireland is one of my favorite countries to visit, ever) is all of the food. Irish food might get a bad rap, but it is fresh, delicious, and simple rustic food that is hearty, comforting, and best of all – easy to make at home! 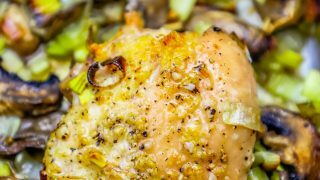 This roasted chicken and leek dinner is a super easy all-in-one meal – but there are a couple of tips and tricks to ensure perfect, juicy chicken and garlicky, flavor packed leeks that everyone will love! 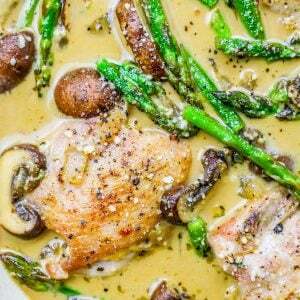 This dinner is so wonderful because it’s crazy easy – AND easy to clean! Simply pop down some foil or parchment paper, and chuck the mess in the trash when you’re done – no pots and pans to clean! It’s optional, but I try to stir the dish around a bit as it cooks to make sure the mushrooms and leeks crisp up and cook evenly. Again – this isn’t necessary, but I think it helps the vegetables soften, crisp, and brown better. 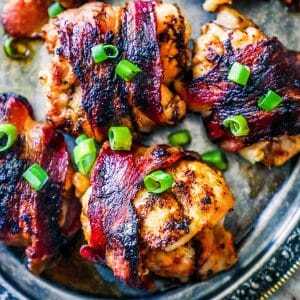 Start the recipe off covered, and then remove the foil partway through to cook it without burning the chicken or vegetables for the perfect easy dinner! 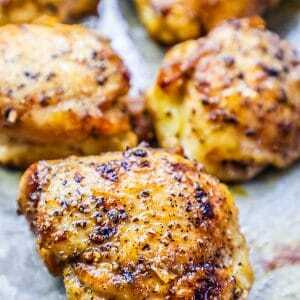 This easy baked chicken and leek dinner doesn’t need any special equipment to make – but I’m sharing a couple of my favorite products that I used when making this recipe extra delicious! 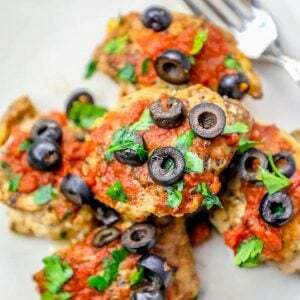 If you love this easy baked chicken thigh recipe, I think you’ll love some of these other deliciously easy one pot chicken thigh meals – most of which are low carb and keto diet compliant! 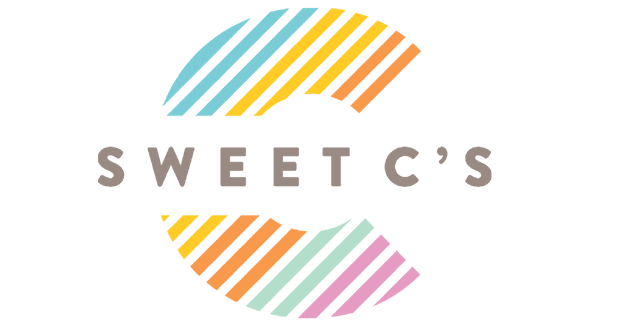 Click the links above to head to each easy printable recipe. 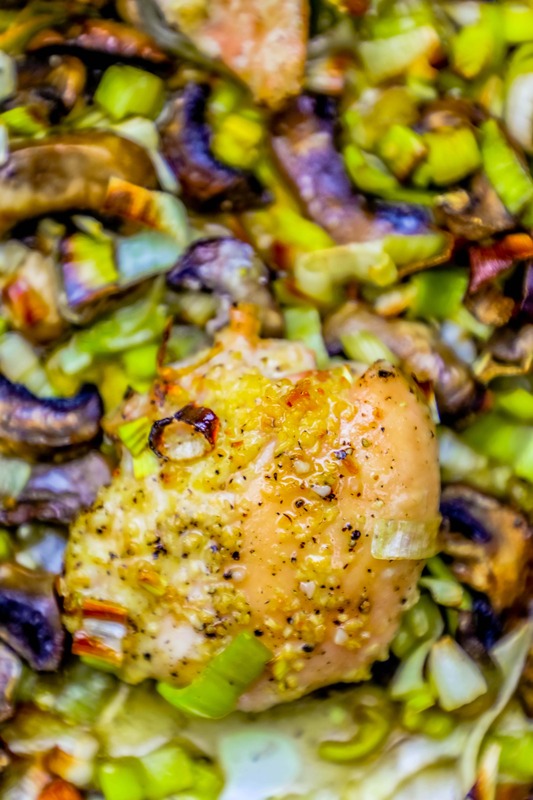 If you love this Easy Sheet Pan Oven Roasted Chicken and Leeks Recipe as much as I do, please write a five star review in the comment section below (or on Pinterest with the “tried it” button – you can now add pictures into reviews, too! ), and be sure to help me share on facebook! Perfect for Saint Patricks Day or a delicious, healthy weeknight dinner - this Easy Sheet Pan Oven Roasted Chicken and Leeks Recipe is simple, delicious, and a huge hit for the whole family! Almost no cleanup and tons of flavor on just one sheet pan! 2 leeks, large - white ends sliced thin, discard woody green ends. 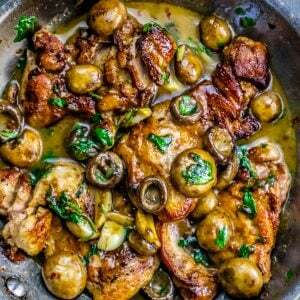 Add chicken, leeks, and mushrooms to pan. 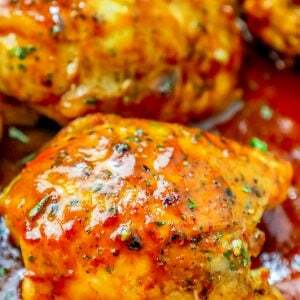 Drizzle with olive oil, then sprinkle with garlic powder and herbs. Toss over ingredients to coat evenly. Spread diced garlic over dish. Remove foil and bake another 10-15 minutes, until chicken is browned and has reached 165 degrees internal temperature. Easy and delicious. I served this over basmati rice with some asparagus as a side dish. Will definitely make this again for company. Just made this the other night. Perfect for the busiest of evenings. I added the potatoes and kept them away from the mushrooms so the liquid wouldn’t absorb and my little ones would eat. Great recipe! Made this for dinner the other night. This could not be easier and more delish! I added potatoes and put them in the opposite corner from the mushrooms to avoid the liquid absorbing. So good!